This class will start with a short version jacket fitting class (2 hours). Then go directly into the jacket class (8 hours). Students will create a scrappy design using a micro-fleece fabric base. Students will trace their custom fitted jacket pattern, onto micro-fleece base. 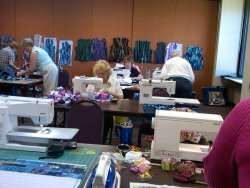 They will learn techniques for applying scraps using the flip and sew method. This jacket style has a figure flattering belt at the back waist and is attractive on all body types. 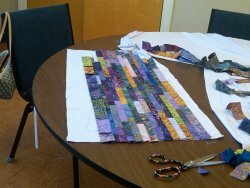 Pre-class preparation: Cut enough 1 ½" strips that when sewn end to end you will have 55-75 yards (depending on your size). Micro-fleece is thin 100% polyester. It is knit on one side and fuzzy fleece on the other side. It stretches, so be careful when handling. This type of fleece is extremely comfortable and feels like a sweater when you wear it. 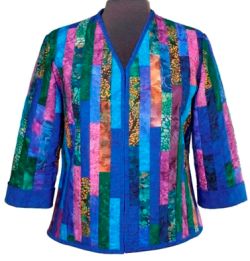 This jacket looks best with batiks that are all of similar color value. i.e. All lights, all medium or all dark values will yield the most Figure Flattering look. The cover jacket has all medium-dark color values.